Over the years, we have often included citations in this newsletter from the most successful investor of our lifetime, Warren Buffett. We anticipate each annual letter from the Berkshire Chairman in the same way children wait for Christmas morning. While Mr. Buffett is often thought of as a value investor (somebody who likes a good deal), he modified this philosophy in a 1989 letter to shareholders when he wrote, “It is far better to buy a wonderful company at a fair price than a fair company at a wonderful price.” This one sentence seemed to mark the start of Mr. Buffett’s evolution from a “deep value” investor–who enjoyed buying dollars for 60 cents–into a growth investor. Decades earlier, Buffett’s Columbia Business School professor and mentor, Ben Graham, delivered a speech before the annual Convention of the National Federation of Financial Analysts Societies. Originally delivered in 1958, an exerpt from this speach seems still relevant:. We agree with Marks. In 2009, some of the best performing stocks over the coming several years were those of companies that were struggling to survive. In contrast, the stocks of some higher quality companies fared more moderately over the same timeframe. Daily, a critical component of our process is identifying extreme investor sentiment. We tend to have more success searching for companies in areas where expectations are low. Currently, with the wide disparity of returns between the growth and value camps, there appears to be no shortage of both low expectation and high expectation situations. 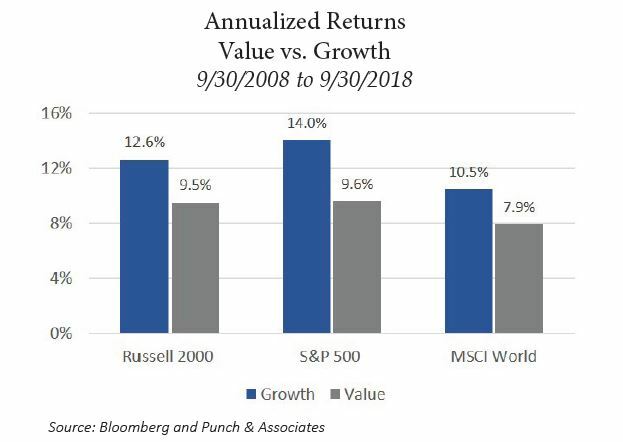 Growth investors are on a roll, and they are feeling good; value investors are humbled and wondering whether they have lost their touch. We’ve heard the phrase, “Buy humility, and sell hubris.” This is why, almost 10 years into this stock market recovery, we are still optimistic that we can deploy your hard-earned capital successfully. Closed-end funds are a quirky asset class in the universe of publicly-traded securities. Structured as investment companies that have an IPO and generally no subsequent offerings, they are akin to mutual funds but with a finite number of shares outstanding. To buy or sell the shares of a closed-end fund, investors must do so from or to other investors on stock exchanges. In addition to this unique structure, the asset class generally receives less attention from professional investors because of its size. The roughly 400 or so closed-end funds in the U.S. have an aggregate market value of around $200 billion—about the same as Procter & Gamble (NYSE: PG). Further, 90% of funds trade at a discount to their net asset value (NAV), and the average discount today is nearly 8%. We find closed-end funds intriguing because of their three sources of potential return: first, from the performance of the assets in the fund; second, from the dividend yield that the fund pays out to shareholders; and third, from a potential narrowing of the funds’ discount to NAV. This third source of return is unique to closed-end funds and makes them particularly attractive in our view. Generally, a fund’s discount (or premium) to NAV reflects how investors feel about the assets owned by the fund. Asset classes that have done well recently tend to offer smaller discounts—or even premiums—to NAV, as share prices get bid up to fair value and beyond. In some cases, investors can bid up fund shares irrationally, creating a bubble. For example, a bitcoin investment trust today has traded at a 100% premium to NAV in the past year! When investors indiscriminately sell an out-of-favor fund with out-of-favor assets, shares can fall well below its NAV and may persist at a significant discount for some time. We look for funds whose shares may have been discarded and trade at substantial discounts. We also attempt to identify when and how these discounts might close. For example, some funds are structured as “term trusts” and have a fixed liquidation date when discounts will likely evaporate. We own a number of these funds in the Punch Income Strategy today. Shareholder activism is another way that discounts on closed-end funds may shrink. A shareholder or group of shareholders may pressure the management of the fund to either merge funds together, buy back shares, or convert to an open-end fund in the hopes that such shareholder-friendly actions will close or eliminate a fund’s discount. In the third quarter, one of our closed-end fund holdings—with an average discount of almost 10% over the past five years—experienced activism by its largest shareholder. The shareholder applied pressure to the fund manager, was awarded a board seat, and ultimately forced the fund to be merged with another fund. The fund also agreed to conduct a tender offer for one-quarter of its shares. In some cases, such actions can benefit all shareholders. We continue to find closed-end funds attractive because of their pricing inefficiency and multiple sources of potential return. Shareholder activism is another potentially beneficial occurrence in closed-end funds, and one for which we are on the lookout. You’ve probably heard of FOMO (fear of missing out), but have you ever heard of JOMO (joy of missing out)? In 1906, Vilfredo Pareto, an Italian engineer, sociologist, and economist, made an observation now known as the Pareto Principle or more commonly, the “80/20 rule.” In an array of applications, Pareto noticed that 80% of effects come from 20% of causes. The Pareto Principle is more flexible than 80/20 however. Sizing can scale up or down, so long as the minority is always producing the majority. When applying the Pareto Principle to the stock market today, we are really talking about a 95/5 force at work. The largest five companies in the S&P 500 Index have a combined market capitalization of $4.3 trillion, which is also the combined market capitalization of the smallest 300 companies in the entire index. That’s staggering! For historical reference, over the last 20 years, the combined market capitalization of the top five companies in the S&P 500 Index has been about $1.8 billion on average. We are in uncharted territory with “mega cap” companies. As investors allocate money to the large end of the market capitalization weighted index funds, a disproportionate amount of the investment ends up in the largest five stocks. The underlying risk balloons in this situation because of the concentration of ownership in just a few companies. Given the unnatural strength of the largest companies, might someone want to give Mr. Market a drug test? As mentioned earlier in this newsletter, investing is hard. You must pick your pain point. If you’re a growth investor, you might get excited early as markets go up, but you’ll likely feel the pain all the way back down. This can lead to permanent loss of capital depending on when you invested. As value investors, our pain is usually on the front end. We have to be patient and disciplined to let our investment thesis play out. We believe the value approach reduces the risk of permanent capital loss. We don’t claim to know how things will end up for the largest companies, but we do know we don’t want to be involved when the money flows out at full tilt. A fear of missing out (FOMO) exists for many investors when greed is driving the market up. Consider the benefits of the joy of missing out (JOMO) instead. The chart below shows that investors can achieve good returns outside of the top decile of the S&P 500 Index. When the Great Recession began in 2007, the top five largest market cap stocks declined 51% from peak to trough while the entire S&P 500 Index declined 43% over the same period. You’d probably experience JOMO not owning the top five largest stocks at that time. In other words, steroids don’t always pay off. Investing in companies with a focus on fundamentals and the opportunity for long-term growth in our view is a better approach than chasing the crowd of popular growth companies. The median market cap of the Punch Large Cap Strategy was $46.5 billion at the end of Q3 2018. Given market conditions, we feel good about our market positioning in the large cap strategy and are actively avoiding participation in the cycle of greed and fear. As we employ patience in this market, we invite you into our joy of missing out. Small cap healthcare stocks look expensive and risky after years of strong performance. Coming out of the 2008 financial crisis, many investors had the common and understandable desire to invest in stocks and industries that had less exposure to financial markets. Badly burned by the worst credit crunch in generations, companies in the healthcare and technology sectors seemed to carry risks wholly different than banks or auto manufacturers did at the time. 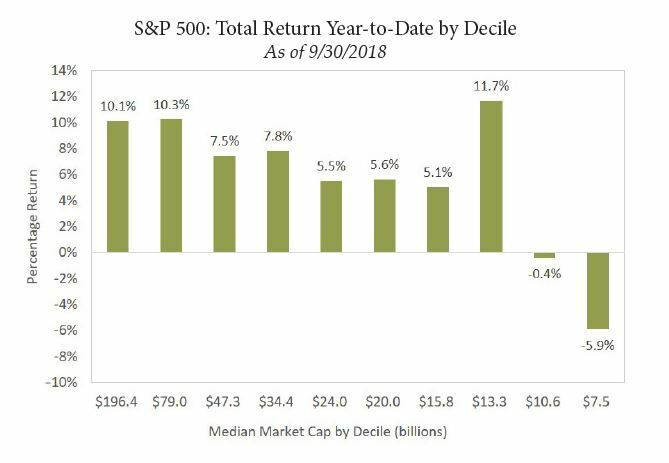 While returns for small cap stocks have generally been positive in the decade since September of 2008 (the Russell 2000 Index is up 11% annually), areas like technology and healthcare have done considerably better. The second-best performing group over the past decade, and the best-performing one over the past five years, has been healthcare stocks. In the past year alone, this group is up almost 30%—more than double the return of the broader small cap market. After a decade-long run of strong performance, two things have happened to small-cap healthcare stocks as a whole: they have attracted a lot of investor attention and capital, and they have become expensive. We believe that both represent risks to investing in this area that were not present a decade ago. To wit, the largest actively-managed healthcare-focused mutual fund in the country, the T. Rowe Price Health Sciences Fund, has seen its assets increase more than seven-fold in ten years. The fund now manages nearly $14 billion in total assets, up from less than $2 billion in 2009. As is often the case, investor dollars tend to chase capital after performance has already happened. As for valuation, the Russell 2000 Healthcare Index recently traded at 3x revenues, which is triple the valuation level it saw in 2009. Healthcare is now the second-largest group by weighting in the index, at nearly 17% of the total, up from a low of only 12% in 2010. These are all signs of a frothy market. What is more, this group is comprised largely of low-quality stocks, by traditional metrics. Of the 388 companies in the healthcare index, 80% of them—or four in five—are unprofitable on an earnings-per-share (EPS) basis. Many are biotechnology or pharmaceutical companies that may not even produce revenue, let alone earnings. When looking at the Punch Small Cap Strategy today, one thing that stands out is our relative lack of ownership of healthcare stocks. While the benchmark index has 16.5% exposure to healthcare, we have only 4.9%. Of the 48 stocks in the portfolio, only three are healthcare stocks, and none are biotechnology or pharmaceuticals. We currently own a homecare services company, a chain of physical therapy clinics, and an imaging equipment manufacturer. We view this lack of exposure as part of the risk control that we embed in our investment process: avoiding popular, expensive, and lower-quality stocks that have done well recently while looking for undervalued, under-the-radar companies that are fundamentally higher quality. The holidays are just around the corner, and you are probably planning to get together with some mix of family members over a meal at least once in the next few months. You might be looking forward to that time, or you might be absolutely dreading it. Either way, you will likely have no choice but to communicate with your family during that time. Take a moment to reflect on your family’s communication habits. Are any topics off limits? Do you have difficulty getting beyond a conversation about the weather? Who are your favorite people to engage at a family gathering and why? We would like to encourage you to think about when and how you will talk with your family about your financial and estate plan. In order to do so, we have two stories to share with you, both of which are based on events that happened to families we’ve worked with in the past few years. One day, a father and his adult son were attending a hockey game. They both needed to use the restroom. While standing next to each other at the urinals, the father said to the son, “Son, your mother and I have worked hard during our lives. You probably can guess that we’ve accumulated significant wealth based on our lifestyle. We’ve decided you’ll be in charge when we die. We trust you’ll do a good job and be fair with your siblings.” Flush. Back to the game. On a different day, a mother and father sat down with their three young adult children at a table. This table happened to be one of the conference rooms at our office, but it could have also been the parents’ dining room table. At this meeting, the parents invited their accountant, attorney, and Punch advisors to join the discussion. The parents introduced the children to their advisors and then started by describing their family values and how they hoped that the children would interact with money over time. The parents walked their children through their balance sheet and recently updated estate plan, giving details about what to expect in the future. Their advisors helped explain the basic ideas the children would need to understand to navigate tax planning and trust administration. The parents and advisors took time for questions. Everyone agreed to meet every three years to revisit the discussion, and the parents encouraged their children to get organized and start their own financial and estate planning process. Do you think the son in the first story will have a different experience than the children in the second story when the time comes to handle the parents’ finances and estate and trust administration? What is the purpose of having a family meeting? We can think of at least three reasons to engage in a conversation with relatives about your financial and estate plan. First, communicating clearly with family increases trust, builds relationships, and avoids misconceptions. Second, hosting a meeting like this invites your family into a conversation about “unapproachable topics.” It’s rare for families to spontaneously begin talking about preferences for end of life care or who will manage the family farm when mom and dad are unable to do so. A family meeting opens a space for interacting around difficult subjects. Finally, intentionally addressing these topics gives your family a roadmap when facing your incapacity or death and they feel lost. Think of this as your family’s business continuity plan. Below is an outline of the elements present in that second story. Think about which elements may work for your family. Don’t worry about designing a perfect conversation. Instead, let this article be a guide to help you think about where to start. 1. Plan ahead. A family meeting won’t happen without some forethought. Start by updating your financial and estate plan before initiating the conversation. You and your advisors should have confidence that you have addressed any lose ends and discussed planning opportunities. Next determine format and venue. Would your family welcome a conversation around the Thanksgiving dinner table? Or would it be better to add some formality and have your family meeting at our office? 2. Determine ahead of time how much information to disclose during your family meeting. Most of our clients worry about the possible negative impact that sharing their net worth might have on their children. They are concerned that information will change their children’s motivation to work and become productive members of society. To be sure, once you disclose your balance sheet to your relatives, you can’t take the information back. Even so, your family will know your financial details eventually. They probably know more than you think now, and there may be a freedom for you and a learning opportunity for them in transparency. 3. Introduce your advisors. Whom should your family call when they need information and you aren’t able to provide it? Important advisors may include your portfolio manager, financial planner, accountant, attorney, charitable advisor, and insurance agent. Consider making personal introductions and also preparing a list of these important people with a description of their roles and contact information. 4. Start the meeting with your family values. Describe the purpose of your wealth for your family and your community. Consider developing a family mission statement while children are still young adults. One of our clients gave us permission to share her family’s mission statement, which is: “Growing to be contributing adults, living with integrity, while loving God and others.” Another of our clients at a family meeting gave his children a list of important financial principles to guide them as they build their own careers and families. Share life lessons with your family and impart as much wisdom as you can in this moment. 5. Walk through your financial and estate plan. This is an opportunity to lean on your advisors to help educate your family. Discuss your balance sheet if you are comfortable sharing numbers. Talk through what happens at each spouse’s death and who will oversee management of the estate, any trusts, tax and financial matters, and health care decisions. 6. Leave time for questions. Our experience is that most children are very interested in this discussion, and they often have questions they’d like to address but they haven’t found the right time to bring them up. The questions might be weighty, very personal, or related to a subject they don’t feel they have permission to raise. You can’t force your children to dialogue with you about important matters, but you can create a space for them to engage with you. We have encouraged and participated in many family meetings with our clients. We have yet to hear anyone who has regretted the decision to gather family together for this purpose. If you have fears or hesitations about how to have this conversation, give us a call, and we’ll gladly guide you in this very valuable endeavor.